As a Canadian citizen, Wafaa Salman has a right to a bright future and to work in the country. But with the Coalition Avenir Quebec’s proposed secularism bill—which would forbid government employees from wearing any religious symbols while on duty—she worries about her future. Salman, who wears a Hijab, said that seeing the hundreds of people in the street in solidarity gives her hope. “We are all equal, we are people. I was born here but my parents are immigrants. I feel like the government wants to cause a division between us, but they must watch out because we are united,” she said. 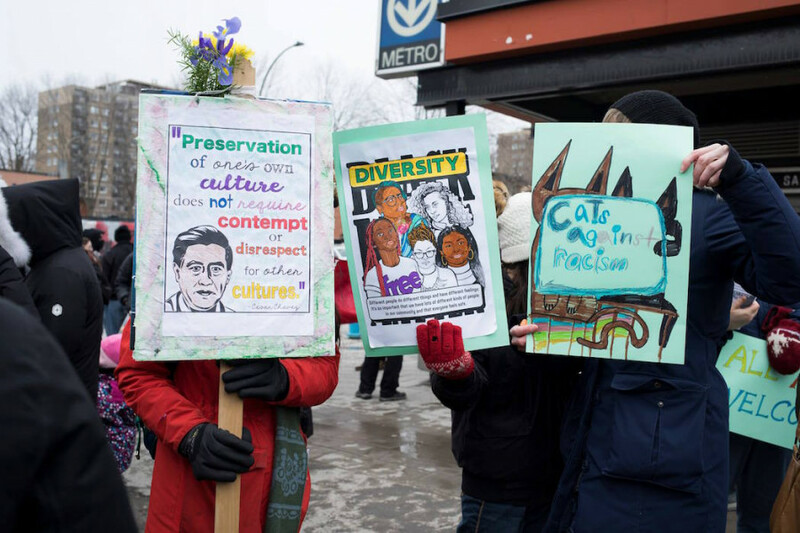 Held at the Metro St-Laurent on Sunday afternoon, hundreds gathered to rally against racial discrimination, occurring in Quebec and across the globe. The march mainly focused on the CAQ administration, as the secularism bill is cancelling over 18,000 permanent resident applications, affecting more than 54,000 people in Quebec. The demonstration emphasized their solidarity with Muslim women in Quebec. This is the third march following ones held in November 2017 and October 2018, coinciding with the International Day for the Elimination of Racial Discrimination. The day was first proclaimed by the United Nations in 1966, in memory of the Sharpeville Massacre, where police opened fire, killing 69 people and wounding 180 during a peaceful protest in South Africa against Apartheid-pass laws. It is known in South Africa as the Human Rights Day. Before the march began, speeches were held demanding justice and freedom from oppression. Others shared their personal accounts, including a woman who faced a threat of deportation. Monika, who didn’t give out her last name for fear of repercussions, left Hungary 10 years ago with her daughter because of discrimination against Romani people and the rising movements of neo-nazism. She said, Canada is failing to recognize the reality that Romani people face in Eastern Europe. “We stayed here because back in Hungary there is discrimination and racism, and I didn’t want my daughter to grow up in that environment,” Monika said. Monika submitted an application on humanitarian grounds last fall but hadn’t gotten a response when the Canada Border Services Agency told the family they must leave the country in two weeks. Monika has asked if her daughter can stay to finish the school year but has been refused. She said that hatred towards Romani people is becoming more normalized due to far-right movements. Monika is urging people to write a letter to the minister of immigration and an emergency vigil will be held today in front of the Holocaust Museum. 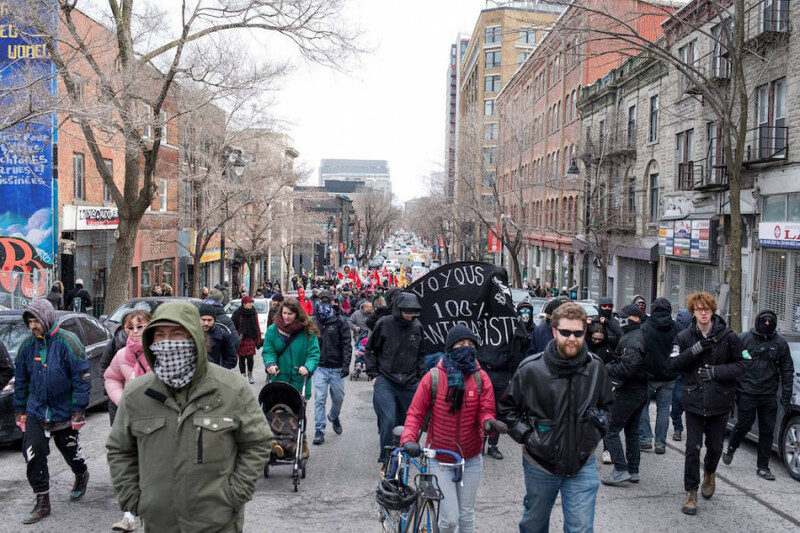 In Quebec, far-right groups have been active, such as La Meute, who the protesters called out directly, calling them racist and saying that the Legault government is complicit. The march passes by the Queen Victoria statue which was painted green earlier today. The Queen Victoria statue on Sherbrooke St. was painted green ahead of the protest by anti-colonial group the Brigade de solidarité anti-coloniale Delhi-Dublin. In a statement online, they say the statue is emblematic of a genocidal and white supremacist heritage. Idil Issa, a writer and known activist in Montreal, adressed the crowd when the march came to halt on Sherbrooke St. in front of McGill University. Issa called out the hijab ban as a warped idea of secularism that bears no resemblance to its origins, which is meant to protect the freedom of conscience. “Because race and racism are socially constructed, we must fight them as a society,” Issa said. “We must tear down old paradigms built on lies about inferiority and supremacy derived from superficial physical traits. Quebecers of faith are facing uncertain and challenging times ahead,” she continued. The protesters also made statements of solidarity with Palestine. A protest against the occupation of Palestine is to be held Sunday March 31 at Concordia University’s Sir George William campus.